This boutique-style 1896-era Olde Town Inn is located in the nationally designated historic Old Towne Neighbourhood in Augusta Georgia. Features include an underground bar The Fox's Lair and free WiFi. The Fox's Lair has been continuously operational for 30 years and features acoustic live music. The bar is open 4 nights a week. Each room features antique furnishings and a private full bathroom. Some rooms feature a 4-post bed and a fireplace. Extras include towels and bed linen. Walking running and bike paths are located beside Olde Town Inn. The owners live 2 minutes' walk away from the inn and can immediately respond to guest needs. Free off-street public parking is available behind the inn. 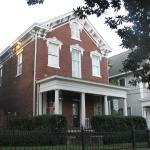 Gertrude Herbert Institute of Art is 300 metres from Olde Town Inn while Magnolia Cemetery is 300 metres away. The nearest airport is Augusta Regional at Bush Field Airport 11 km from Olde Town Inn.